Sunset-gold in colour, Whitstable Bay combines delicate hints of fresh hops with the softer, buttery richness of pale and crystal organic malts and is delightful on its own or paired with summer holiday delights such as Whitstable oysters, potted shrimps, or traditional fish and chips. 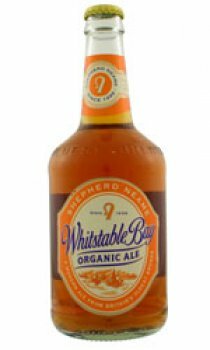 Whitstable Bay Organic Ale is named after the Kent coastal town, famed for its oysters, and makes a great partner for light dishes such as seafood and salads. It is a light, refreshing ale made from chalk-filtered mineral water, organic hops and winter pearl malting barley.